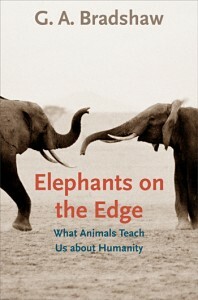 BOOKS: "Elephants On the Edge"
The well-being of animals matters, and not only because, as Jeremy Bentham said, “The question is not whether they can talk or reason, but whether they can suffer.” What’s more, we’re in this world together, and how animal life fares, so, eventually, fares humanity. As G.A. Bradshaw explains in Elephants on the Edge: What Animals Teach Us About Humanity, we have a lot to learn from our four-footed friends. Currently, through culling, warfare, and habitat loss, the elephant population is down to a few hundred thousand (from millions), and elephants are truly traumatized; they’ve lost their longstanding culture, and youngsters have few older elephants from which to learn.